Why investing in the outskirts of Bangalore is a great Idea? The emergence of Bangalore as the centre of India’s IT and tech industry has led to a subsequent real estate boom – especially in the bordering suburban areas of the city. In the past decade, the garden city of India has witnessed a rapid appreciation in property prices, mainly due to the floating population of working professionals moving into the city in search of job opportunities. If you are planning to make a wise investment in the thriving property market of Bangalore, then the outskirts should top your priority list. Read on to know why. The outskirts of the city, like the burgeoning locality of North Bangalore, are the most-preferred destinations for real estate investment. Properties in North Bangalore are in close proximity to the Kempegowda International Airport and Central Business District. Areas like Yelahanka, Hebbal, Devanahalli, and Thanisandra are hot selling real estate destinations for business travellers and frequent flyers. Additionally, you will never feel alienated from the prime locations of the Bangalore city since these areas are well connected by the Namma Bengaluru Metro Rail. The emerging Peripheral Ring Road and Bellary Road will further improve the accessibility between North and South Bangalore. The IT boom has significantly changed the landscape of real estate business in Bangalore. One of the major reasons why corporate giants prefer outskirts is due to the availability of numerous commercial lands. The rapid economic development in the suburbs is directly proportional to the increase in high rise residential complexes. With the rise in the number of IT and tech giants, a large population of the techies is migrating to the suburbs considering the proximity factor. Most working professionals prefer burgeoning localities like Whitefield and Sarjapur due to the high appreciation rates they offer. The outskirts are an excellent option for making a smart real estate investment in Bangalore due to its fast appreciating rates. Most of the properties in the suburbs offer great returns at lower prices as compared to ones in the prime locations of the city. Additionally, the suburbs are great for generating high rental income. This is mainly because of the vast majority of working professionals looking for residential accommodation near their offices. This works well to the advantage of the buyer. You can also enjoy world-class infrastructure and better accessibility to reputed educational institutions, hospitals, shopping complexes, and multiplexes. Home is where your heart is. It is the most comfortable place where you unwind and relax after a long day. It is where we find peace for ourselves. Finding a home in a suburb has its own charm and beauty. With the increased number of lifestyle diseases, it is always advisable to choose a locality away from the hustle and bustle of the city. These areas provide a peaceful and pollution free environment. Also, many of the apartment complexes here have incorporated green concepts and are pet – friendly. To add to that, terrace gardening is becoming extremely popular in gated communities, bringing you one step closer to nature. Deciding on the type of property you want to buy is one of the main factors that influence your investment in real estate. However, when it comes to buying a property in the suburbs, you will be spoilt for choice. From gated communities and studio apartments to villas and new launches, the world is your oyster. You can also decide on the type of the project that you want to invest in depending upon the budget, time frame of your investment and the amenities provided at the development. For instance, Assetz 63° East, located off Sarjapur Road, is a 26.38 acres sustainable township that offers eco-friendly luxury apartments for a wholesome community lifestyle experience. 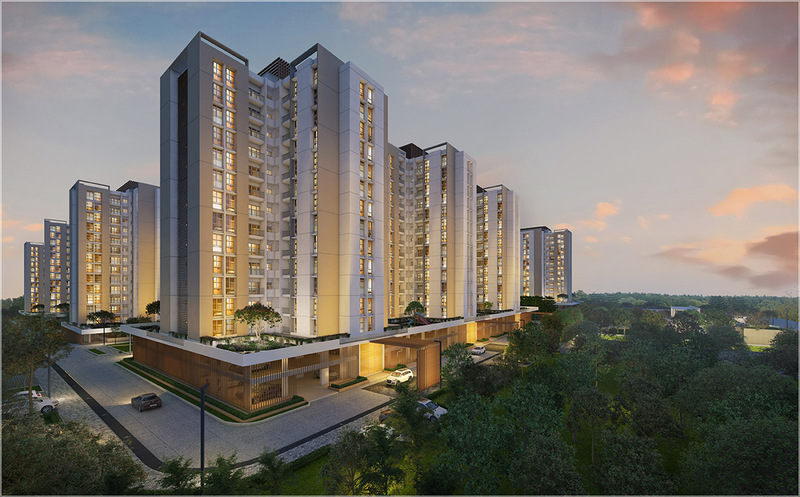 Live amidst lush greenery with 66% open spaces in a home that is crafted keeping the urban family in mind. There is no doubt that location is key for an ideal real estate investment and the suburbs of Bangalore offer everything you are looking for. The properties here offer the twin benefit of affordability and convenience. Additionally, these areas are constantly undergoing rapid infrastructural development, offering higher returns and appreciation. With so many benefits in store for home buyers, it is time you head out to the outskirts to make a smart investment. Visit Assetz Property Group today and get one step closer to your dream home.